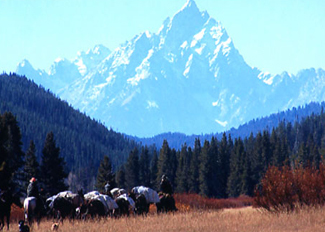 Come ride with us for your Jackson Hole Horseback Adventure! No one else has views like these! Our guests tell us that we have one of the top 5 trail rides worldwide! You never know who you may see! Our guests return year after year for Jackson's best horseback trail ride! Visit us at Teton Horseback Adventures, located on Pacific Creek Road, north of Jackson Hole, just outside of Grand Teton National Park for your Jackson Hole Horseback Riding experience of a lifetime! We offer the most remote & unique hourly trail system in the Jackson Hole area! Lots of creek crossings, flowered trails, wildlife and the best views of the Teton Mountain Range! We also offer Teton Pack Trips ranging from overnights to a 5 night, 6 day Pack Trip package in the Teton Wilderness and the Bridger Teton National Forest! Learn more about our Teton Pack Trips here! Teton Horseback Adventures prides ourselves as the only Trailride operation who can accommodate you as you come in. We employ extra wranglers and we own (not lease) over 100 head of very gentle horses for all ages 6 yrs and up. This means no more stress on trying to be there on the hour or by the hour!! The drive to us is well worth your time to experience the beauty we have to offer! Visit us at our Base Camp outside of Grand Teton National Park today! 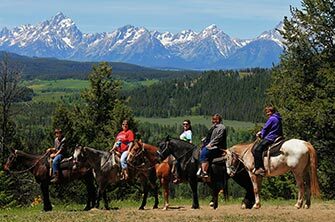 NEW TO TETON HORSEBACK ADVENTURES!!! Lake side camping in beautiful canvas tents with real king & queen beds and blankets. Fall a sleep to the sounds of Tillery lake water fall! It is still camping but with comfortable beds. Don’t forget your fishing license and join us on our 24 foot pontoon boat for some great fishing! Or choose to take a cruise around Grassy lake just to relax! We offer paddle boats on Tillery Lake as well. For the hiking enthusiast we have beautiful hiking trails close to camp, with scenic water falls which offer fun for the whole family. As you make your way to or from Yellowstone or Grand Teton National Park we are situated near the south entrance of Yellowstone National Park on the line of Grand Teton National Park and adjacent to Grassy lake and Lake of the Woods. Your host for your memorable outing is our daughter Chelsi and her husband T.J. For more info click on picture. We are also Swift Creek Outfitters. Our Teton Big Game Hunting Camps offer some of the best hunting opportunity in the Teton Wilderness and Grand Teton Park boundaries! Our horseback rides have some of the most scenic views in the world! We offer the best trail ride system for kids and adults of all experience levels. Groups of 8 or less do not need scheduled in, larger groups give us a quick call. We have many great horses and experienced wranglers to accommodate your large group. Come on out! Join us for a 1-5 night adventure in the historically famous Teton Wilderness that includes beautiful campsites, your own personal horse, second to none fishing, great food, and unforgettable views of wildlife, rivers, lakes, and waterfalls. Must check this out! In the fall we are well known as Swift Creek Outfitters and have been in this family run business for many years. 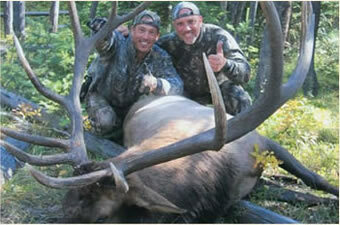 We have experienced guides, cooks and excellent horses to make your hunting experience unforgettable!